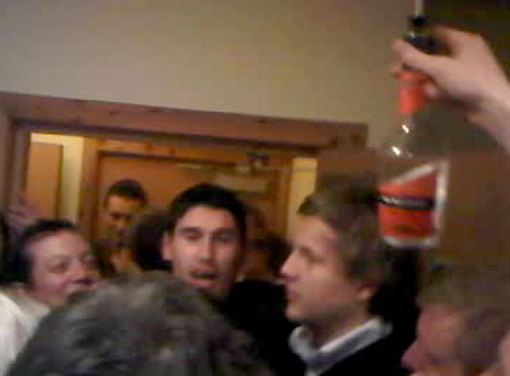 Gareth Barry, photographed near some booze. The horror! Manchester City players Joe Hart, Gareth Barry, Adam Johnson and Shay Given were rumbled enjoying themselves a bit too much at a university party in St Andrews, Scotland, on Monday – just one day after their team lost 3-0 at home to Arsenal. This will not stand, man. Seriously though, who said footballers weren’t allowed to have fun too. It’s just a bit weird that their idea of fun is dancing to ‘Jump Around’ by House of Pain in a tiny living room, whilst swigging from a bottle of blue Thunderbird. Or somesuch. Shame they don’t play for Man Utd, otherwise the starstruck students at the party would have been treated to the sight of a red-faced pensioner storming in and dragging the quartet out of the house by their collars. Bob Mancini probably just shrugged and poured himself another shot of grappa. surely they can’t be in trouble for this! i’d be ecstatic if i got to party with some manc’s at my uni! Oh lmao… The video ‘wot the sun got’ is well funny too… Mr Barry! Mr Barry! Am I the only person who finds this disgraceful? Man City must be paying them god knows how much a week and they turn up and drink the students booze! I bet they didn’t even contribute with a crate of fosters. You wouldn’t catch respectable men like Gazza doing that. that can’t be them, everyone knows joe hart can’t dance. thats pretty expensive alcohol for students. wasnt like that in my day, all white lightening and carlsberg on offer for special occasions.